18" Dual Fan Mini Split Stand. Holds up to 400 lbs. 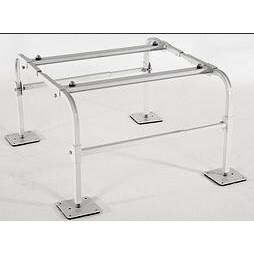 The Mini-Split Stands provide a safe, stable platform for mounting a wide variety of HVAC/R equipment. It keeps unit elevated above lawn mowers, weed trimmers, pets, snow and flooding. The elevated height allows for ease of installation, maintenance and service. These stands come in two convenient depths (Wide and Thin) to ensure a perfect fit for most all mini-split condensing units. Refer to the compatibility charts to quickly select the stand that matches your equipment.